I actually made both a Lemon Torte and a Chocolate Torte, but for the chocolate I used a box of organic pudding. I’ll show you the differences in ingredients between the box of Jello lemon pudding and the box of organic chocolate pudding. Granted, homemade pudding would be even better, and hopefully someone will share a good recipe with us, but these are what I used this time. When you can't pronounce some of the ingredients, that's never a good sign. We’ve had this recipe in the family for years, but I’ve made some changes to get rid of some of the junky stuff. 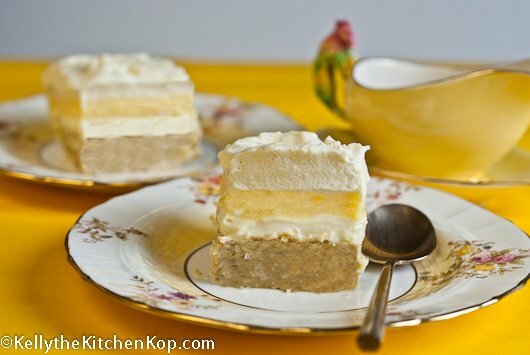 It consists of 4 layers of fun: a crust, a cream cheese layer, a pudding layer (you can make whichever flavor you’re feeling like that day – variations below), and a whipped cream layer on top. Take a look at the recipe and I’ll show you ways I made it a little better, but still not ‘healthy' due to the sugar. If you’re like me though, and you know you’re going to make something like this now and then to take when you go somewhere, my changes at least get rid of the high fructose corn syrup, preservatives, artificial colors, etc. And with the better ingredients I use, it adds a few healthier nutrients, like part whole wheat flour, crispy nuts, and the healthy fats in the butter, cream cheese, and real cream. Start the pudding, using about ½ c. less milk than it calls for, so it’s a bit thicker. If you don’t use the Jello junk (1 or 2 boxes of 3.4 oz. size/instant), then you’ll need to stand there and stir it for 15 minutes or so while it thickens. Yes, it’s a pain, but here's my secret: have your kids help! Give them a stool and let them sit there and stir. (Obviously, only do this if they’re old enough to safely be that close to the stove.) Once it's thick, set it in the frig to set up more until you’re ready to spread this layer on. Garnish with whatever might go with your flavor of pudding: more crispy pecans, shaved chocolate, organic chocolate syrup drizzled around the top, bits of lemon zest, mini chocolate chips – things like the nuts and chocolate chips are nice if you’re taking it somewhere, so you can put a little Press & Seal on top without it getting onto the whipped cream. You could use vanilla pudding, then shave some chocolate on the top. Or squirt a little organic chocolate syrup on the cream cheese layer, use vanilla pudding, and more organic chocolate syrup to make a little design with it on top. For Turtle Torte: on the cream cheese layer drizzle some caramel (this post has a simple caramel recipe or here's another caramel recipe), use chocolate pudding, then add crispy pecans on top of the whipped cream layer. Caramel Torte: Same as the Turtle Torte only use vanilla pudding. Chocolate/Peanut butter torte – chocolate pudding, along with a PB layer, made with a mixture of 1 cup PB, 1/4 cup butter, and 2/3 cup organic powdered sugar. Feeling overwhelmed about eating healthier? Look over these Rookie Tips! This looks delicious! I am new to your site and have enjoyed rummaging through a bit….Have followed Weston Price principles for over a year but of course still learning and trying to add to my recipe pile!! Oh, and I’m going to make that yummy recipe next week for sure. Such great scoop, Nancy, I love it! Oops…I brown the chicken in half coconut oil, half butter. Sorry! Kelly, I am talking about the canned coconut milk (Thai brand is what I can get here). Surprisingly, no, it doesn’t taste like coconut at all! It is a very mild, rather bland flavor that is slightly sweet, but not so at all when you dilute it. Not any sweeter than milk anyway. I think you’d like it. Sally F. uses it in many of the recipes in Eat Fat Lose Fat. I bought that book years ago when I started cooking/eating more traditional foods. I went to the bookstore to try to get Nourishing Traditions and they didn’t have it, so I figured this one by her would be the next best thing to read while I waited for the other one to come in. I should write a review for your “good books” post, because EFLF was wonderful and explained the good fat/bad fat issue more understandably than anything I have read by her or Mary E. or anyone else. As I write this, I am drinking a mug of chicken (bone) broth with coconut milk in it…so good, and as much as I love coconut, it doesn’t taste like it at all. I also add it to my chicken and rice soup for a little more body (and lauric acid) in the broth. I make a wonderful chicken recipe where I brown sliced onions and garlic and chicken pieces (usually thighs and breasts, bone in, skin off) in coconut oil and then pour a can of UNdiluted coconut milk over it. I cover it loosely with a lid, and simmer it until the chicken is nearly done. Then I lay 2 long sprigs of fresh rosemary over the top of the meat and cover it. I let that simmer for another 10-20 minutes or so and oh, man, is it good (if I do say so myself)! It is a favorite with my children. I tried some of the Thai dishes that use coconut milk, and my Southern family just couldn’t wrap our taste buds around them. Traditional cooking adapts so well to the way we cook in the south, and I have really embraced it after trying for so many years to “lowfat” all the recipes of our heritage. What was I thinking?! I have also made powdered Rapadura in the blender and food processor. It works great. I’ve never tried to make enough to make icing, but have used it in whipped cream and to sweeten cream cheese. It is wonderful for that…add some chopped dried apricots and some pecans…mmm! Hey…I should also mention that coconut milk is another good way to get medium chain triglyceries in our diets, esp when we have reluctant children (teens esp) to please. It took one of my sons awhile to be able to like coconut oil. I could make a smoothie for him and add oil and he’d give me “the look,” but when I made it half and half with raw milk and coconut milk, he didn’t even know it! Okay, you can tell it is a slow day at my house! Sorry! Marsha, maybe you could use organic corn starch? I found some the other day. Nancy, no coconut taste in coconut milk, really? I love the idea to use this to fill in when we run out of our raw milk! I know this is an older post, but I thought I’d mention that canned coconut milk diluted 1/2 with water makes wonderful cooked pudding. I try to save my raw milk for only raw consumption, and have found that coconut milk subs great in nearly everything. No coconut taste, and extra lauric acid to boot! I keep cans of it in my pantry and mix it up for this kind of thing. I have used it for banana pudding, chocolate pie, coconut pie, for the milk in biscuits and other baked goods, etc. I’ll put my 2 cents with Meg and maybe we’ve got something! My mom made powdered sugar in our Vita-mixer one time when I was a kid. It was just sugar and cornstarch. I looked up the proportions online and it is 1 cup sugar to 2 T of cornstarch. Are there any good substitutes for cornstartch? I’ve thought of making my own powered Rapadura also just for the recipe you posted! Also if you don’t have access to raw milk, coconut milk is a great substitute in a recipe like this. A substitue for any kind of sugar in whipping cream (whether it calls for powdered sugar or other sugar) is to use stevia. I make my whipping cream with stevia and vanilla extract and it’s wonderful! No sugar needed. Fred, I’d like to check out the ingredient label on the all-natural jello – I didn’t see one at your site. Thanks for the homemade recipes everyone – I can’t wait to try them, especially the baked pudding, so I don’t have to stand there stirring. Liz, my mom made a lot of food from scratch, but pudding was never one of them! I didn’t know anyone made organic pudding yet. I’ll keep my eye out for it. I quit making Jello and pudding altogether a while ago, because it just seemed like so many wasted calories. Cook above over med-high heat and stir constantly until thickened (this can take awhile). Also, just an addition to your “make your own whipped cream” tip: You can place stainless steel bowl and utensils in the freezer for and hour or so before whipping and that might save the ice step! Have you posted how to make your own cream cheese?? Here is a recipe for chocolate pudding that I love and the link to the original blog where the recipe originated. In a medium saucepan, whisk together milk, egg yolks, rapadura or maple syrup, cocoa, arrowroot powder and salt. Cook over medium heat, stirring CONSTANTLY until pudding begins to thicken. Remove immediately from the heat, and continue to stir until pudding is creamy. Add butter and vanilla and continue to stir until mixed. Pour into serving dishes and serve warm, or chill for two hours and serve cold. Beat butter and sugar together in a mixing bowl until fluffy. Add egg yolks, lemon juice and rind and beat until well combined. Add flour and milk and beat again. In another bowl beat egg whites until stiff. Fold egg white gently into the milk mixture. Turn batter out into a buttered pudding dish or 9 x 9 pan. Set pudding dish in a shallow pan of water, making sure water is not deep enough to boil over into the pudding. Bake in a preheated 350 oven for about 45 minutes or until toothpick inserted comes out clean. Hi Kelly… your post made me chuckle. Growing up my Mom never bought a box or package of anything. 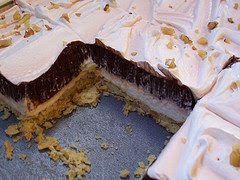 When we made a lemon meringue pie or chocolate pudding pie, we ALWAYS made it from scratch. (Same for vanilla and butterscotch too.) Lemon juice and grated lemon peel are what give the strong lemon flavor. Grace recently noticed the boxed pudding mixes at the store and asked about them. I told her I would show her how to make real pudding at home. I want her to know that food, even treats, come from real ingredients and not boxes and mixes. My yummy recipes are the same ones I've grown up with my entire life — from the Better Homes & Gardens red plaid cover cookbook. If you'd like me to post them I can, but they will take up a bit of space in the comments section. To replace artificial gelatin Jello, I suggest you use agar. This healthy, tasteless seaweed is a source of fiber and calcium (and remember that calcium is useless without proper amount of Vit D!). Agar is also what is used the the first ever entirely natural, kosher, vegan jello dessert to be launched soon. Please feel free to visit jelaia.com. Thanks for this recipe. I have a friend who was famous for what she called “Chocolate Delight”, it was delicious, but something a person could only eat once in a while. Nice to have a healthier version of it. The lemon version sounds delightful, and I love lemon. Ah yes, this is why it’s never good for me to think alone. 🙂 And by the way, I actually think what I have in the cupboard is an organic lemon extract, now that you mention it.